The live-action Sesame Street musical is set for January 15, 2021, and starts shooting in July with MGM co-financing with WB. The hybrid T&J, directed by Tim Story, will arrive three months later on April 16. Portlandia co-creator Jonathan Krisel is set to direct the family musical with 21 Laps’ Shawn Levy producing with Entertainment 360’s Michael Aguilar. Anne Hathaway is reportedly on board for the revival which would bring Oscar the Grouch, Cookie Monster, Big Bird, Elmo and other denizens of Sesame Street to the big screen for the first time in this century. Sesame Street, which airs on WarnerMedia-owned HBO these days, turns 50 this year. 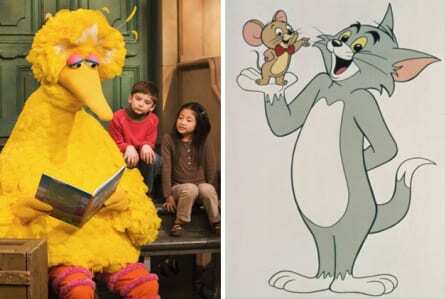 The television production of the Children’s Television Workshop has yielded two previous theatrically released feature films: Follow That Bird in 1985 and The Adventures of Elmo in Grouchland in 1999. Both were live-action films incorporating puppets with The Jim Henson Company producing, alongside the Children’s Television Workshop and Warners. The slapstick cat-and-mouse antics of Tom & Jerry have been around since 1940 when they were introduced by William Hanna and Joseph Barbera, the animation tandem would become a dominant force in television animation later with The Flintstones, Scooby Doo, The Smurfs, The Jetsons, and The Super Friends. The first Tom & Jerry short is considered Puss Gets the Boot (even though the rivals weren’t identified by their familiar screen names) which MGM released in February 1940. The audience response was strong and after Puss Gets the Boot was nominated for an Academy Award in the animated short category MGM was eager for follow-up efforts in the same vein. In 1941, the Hanna and Barbera team delivered with The Midnight Snack, an epic animated struggle set amid the hazardous battlefield of a kitchen — and this time with Tom & Jerry identified as tandem brand that would quickly gain popularity. Between 1940 and 1958, the original Tom & Jerry series yielded 114 shorts and won seven Academy Awards in the animated short category. Television franchises, more shorts and a 1992 feature film, Tom & Jerry: The Movie would follow over the decades. As it stands, the Sesame Street pic will open against an untitled Blumhouse pic from Universal and Paramount’s kids TV adaptation Rugrats. That date had been reserved for an Untitled WB Event Film. Tom & Jerry have their release date to themselves for now.